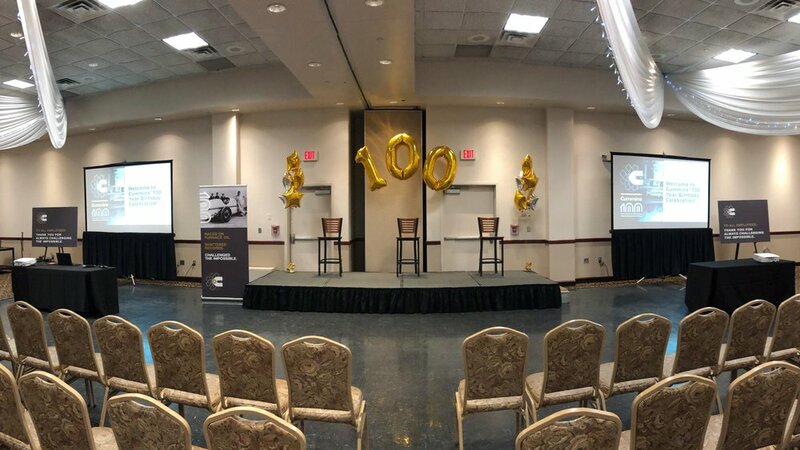 AV for You provided Audio and Video Rental Equipment for a Cummins’ 100 Year Birthday Event at the Mermaid in Mounds View, MN. For audio rental equipment we set up our Mackie 1402-VLZ4 14 Channel Mixer and our Shure QLXD4 Distro Wireless Microphones with three lavaliers and one handheld microphone. For video rental equipment we front projected two of our NEC 3K HD Projectors onto Da-Lite 8’ Tripod Screens. We used our Decimators to distribute HD video to the projectors.